The Bridge is a documentary about the Golden Gate Bridge and the tragic loss of life that is voluntarily given by so many. The filmmakers captured 23 of the 24 suicides that took place from the bridge in 2004, and show the stories and footage from some of those who jumped to their death as well as a survivor and a rescue. While the subject matter is very dark and bleak, the stories run the full spectrum from awe inspiring and forgiving to maddeningly depressing. It is an eye opening look at something that we as a society choose not to see, or choose not to think about. Eric Steele directs the documentary while conducting interviews with witnesses and family members of those who are no longer with us. Some have found an understanding and carry with them a forgiveness for those who chose to end their lives while others are still questioning and baffled by the loss. For anyone who has dealt with mental illness in their lives, whether it be through a family member, friend, or even themselves, there is a very real feel to the stories that one can easily understand. For those who have never experienced something as chaotic as mental illness, the film offers great insight into the human psyche and just how far we all are and feel from time to time. From the thermals that warp the footage on hot days, to the clouds and fog that roll into the bay and shroud the bridge in a mist, the film brings the viewer right up to the cold, damp railing and lets you experience the rumble that vibrates through it as well as the bounce that you feel when you stand upon the bridge as a truck drives by. From the people who refuse to look up from their shoes as they walk by someone sitting on the railing to those who stop and try to talk to them, there is a sense of tragic loneliness as well as heroic interception that the film brings to the screen so beautifully in an agonizing way. 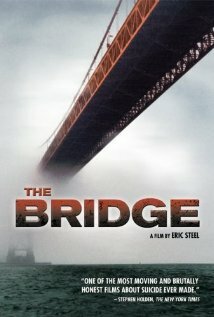 The Bridge can be found on Top Documentary Films and streamed for free. 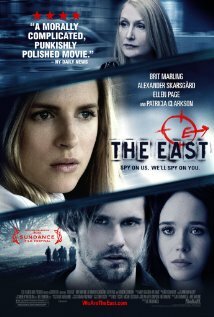 The East is 116 minutes of great acting, wrapped around a twisting (yet predictable) plot of Eco-terrorism, Anarchist mayhem, economic sabotage, and parental rebellion. If Fight Club had begun as a hippie movement focused around a Guy Fawkes concept, The East is what it would have been. However, don't expect an all loving, spiritual awakening type of film, it still rubs raw the ideals and expectations of the naive with brutal truths and discoveries. Zal Batmanglij wrote and directed a great film. While it is not his first outing in the directors chair, it is by far his most well polished work thus far. Brit Marling ("Arbitrage") plays Jane, an operative for a very deep pocketed elite private investigation firm that is sent out to infiltrate the group as Sarah. What she finds is a well polished and close knit group of like minded people, most of which have a very personal interest in the anarchist movement that is The East. Alexander Skarsgård ("True Blood", "Battleship") completely sheds his inner vampire for this role, and does an extraordinary job portraying Benji, the cautious and scarred Zen like commander of this leaderless pack of renegades. Ellen Page ("Juno", "Inception") takes hold of the reins of Izzy, a protective and very defiant young woman who does not take kindly to the uninvited introduction of Sarah into their little family. The actors do an absolutely outstanding job creating unique and likable characters. From Shiloh Fernandez ("Evil Dead", "Red Riding Hood") as Luca, the motherly one of the group who brings Sarah in when she needs medical attention, to Toby Kebbel ("Wrath of the Titans", "RockNRolla") as Doc, who struggles with his own physical limitations and provides the medical help that the group sometimes needs. There is zero weak links in the chain of actors in this film, even the supporting cast all do an outstanding job peeling back the curtains and giving the viewer a glimpse at what it is like to run rampant upon the corporate world with revenge and retribution fueling the fires of well conceived chaos. Most of the film takes place in and around an old half burned down home in the forest, which the group uses as its temporary headquarters while they carry out their Jams (attacks). The cinematography is spot on and always finds a way to incorporate the surroundings, whether its peeling wallpaper or horses running across a meadow into the story to keep your eyes entertained and your mind thinking. What is important, what isn't? It's a very well conceived film that unspools as a bit of a mystery as you ride along with Sarah as she tries to uncover who trusts who, who might be dangerous, and who is on to you in an adventure you are sure to enjoy. The East is in Theaters now. 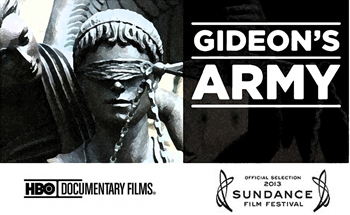 Gideon's Army is a documentary film that tears the rusted lid off of the justice system to expose the hidden truths behind why Lady Justice wears a tear stained blindfold. Dawn Porter is the founder of Trilogy Films and along with Motto Pictures and HBO Documentaries they follow the lives of three Public Defenders who give everything they have to strive to prove that a person accused of a crime shall indeed be held innocent until proven guilty in a court of law. Travis Williams, Brandy Alexander and June Hardwick confirm the nightmares that anyone who has ever served as a juror knows first hand, that our justice system is flawed, and that the assumptions of guilt can quite easily be the downfall of the innocent. The film deals heavily with the morality of personal struggle and in no way, shape, or form does it endorse or celebrate the protection of the heinous criminals who feed like parasites off of the dedication and hope of those who are there to attempt to counterbalance the heavily laden scales of justice to give everyone a fair fight in court. It is far too easy for those who have never experienced the cold hard glare of the American Justice System to sit back and assume that all is well, and that no person can be found guilty unless they are guilty. I mean, they must have done something to be arrested in the first place, right? Wrong! Gideon's Army is the gavel slamming hard against the well oiled and waxed table top of preconceived notions. Before you find yourself in front of a judge in a court of law as a defendant you should know just how stacked against you the deck truly is. Gideon's Army will give you a glimpse of the horrors that await, and also show you that through dedication and hard work, there are indeed a small group of people out there who are fighting just as hard as you are to keep you innocent until proven guilty. 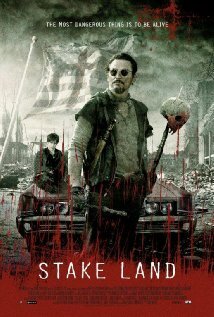 Don't be confused by the name, Stake Land is not a low budget rip off of Zombieland. While the effects sometimes leave something to be desired, as well as the behavior of the infected vampires, the plot is fairly solid with some great ideas used in the story line. Nick Damici ("The Black Donnellys", "World Trade Center") plays a great renegade survivalist called Mister. Taking the young Martin, played by Connor Paolo ("Camp Hell", "Alexander") under his wing after his parents are slaughtered, they travel the back roads while keeping distance from the religious Brethren, who believe vampires are God's punishment. The visuals of an apocalyptic world are very nice, although they don't really make up for the failure of the vampires who look like diseased clowns and move like amateur stunt men fresh out of high school. Written by Jim Mickle and Nick Damici, this movie would have made a great novel where the imagination could have created more terrifying vampires while holding onto the great locations and scenarios that the actors find themselves in. The one saving grace for this film as well as the most creative reason for watching it is the way in which the Brethren attack a small community of survivors. While I won't hint at how it is done, I will suggest that you see the film, if only for this one segment of great film making.